I love to work out with great music; I feel that a lot of times, the right music helps to increase my focus, intensity, and overall determination to finish the task at hand. So it is with my writing. 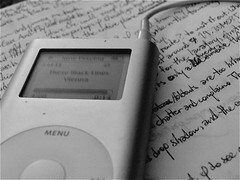 Overall, I have different types of music for different types of writing. For example, my “wake up, morning writing” is set to Snow Patrol and Dashboard Confessional. I just think it’s amusing that my current writing project relies heavily on my Disturbed station on Pandora Radio. Don’t worry. My story isn’t about death, destruction, or mayhem (though I’m not saying it doesn’t contain these things… 😉 ). I think the music though helps me in the act of writing; to keep going and give me the drive to finish, as if I were in my squat rack, or the last interval of a high-intensity interval training run. Plus, it helps give amazing focus, by shutting out the rest of the world, and clarity, as if my subconscious is suddenly open and available to me. With that said, time to turn Pandora Radio on, and dream of my worlds. I love writing with music. My choice was always Bauhaus which was very appropriate since my novel is based in 1982.